One thing that Skyrim really goes all in on, though, is limiting the incongruous elements on your screen. The idea here is that presenting players with things that remind them that they’re playing a video game undermines a sense of spatial presence and immersion. 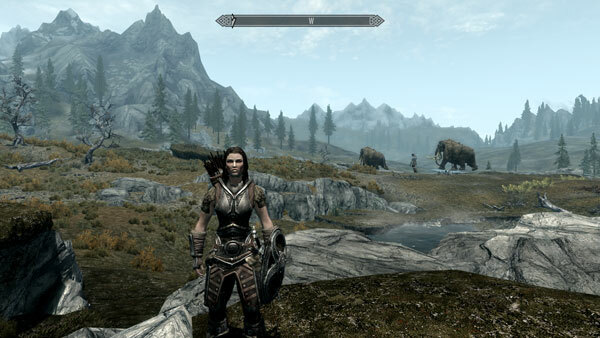 Skyrim conspicuously omits or minimizes things like damage indicators, cooldown timers on abilities, level indicators on enemies, icons indicating effects, and HUD elements to activate powers or items. It’s super minimalistic and a far cry from something like World of Warcraft where you’ve got numbers bubbling off enemies like fireworks and half your screen is taken up with icons, minimaps, and hotkeys. The result is that it’s easier to lose yourself in the world, as many of us are finding out. Just a compass, a crosshair, and that Lydia chick who keeps getting herself killed. That said, I wonder if Bethesda’s pursuit of immersion has actually gone too far. Skyrim’s anemic UI actually often fails to give you information that you really need and want. Say you’ve just gotten a new Fear spell that affects creatures up to level 10. Soooo… What level is that wolf? Or that bandit? No way to know, really. And how much longer until my protection from frost potion wears off? Is my weapon still poisoned? And I can’t tell you how many times I’ve blithely trooped around the landscape while diseased or cursed because I failed to dive into a UI two levels deep to find out. And don’t get me started on favorites and hotkeys. One universal complaint of the game seems to be that the UI is awful, and I have to wonder how much of that was exacerbated by an iron clad design goal to shove everything possible off the main screen in order to increase immersion. Despite how much I’m enjoying it, it kind of strikes me as an example of swinging too far to the other extreme. Immersion is a very laudable goal, but in computer/video games the interface is everything. There is no excuse for a bad interface, as poor controls can ruin a game faster than any flaw (aside from technical problems so bad you can’t actually play the game, of course). If immersion is part of the reason this game has such a bad UI, then I think they missed the boat badly here. But honestly, doesn’t it seem like every Elder Scrolls game has at least one tremendously huge, glaring, game ruining flaw? Daggerfall: Buggy to the point of being unplayable. Morrowind: Aside from how brown/yellow/orange this world was, I don’t remember much. I wonder if this immersion factor is what causes me to have motion sickness when playing Skyrim. My brain is confuzzled! And to think that I’ve seen mods that let you remove even more from the interface! Remove the compass on the top so you have to find the enemies yourself, remove the stealth indicator so that you can’t tell if people can see you or not, even remove the text from your cursor so you have no idea if the item you’re trying to take is considered stealing. I actually prefer to remove the compass, but the complete lack of any convenient way to view my currently active buffs is what bothers me the most. The game really wants to encourage me to use temporary buffs in the form of potions and armor spells, but in the heat of battle, I have no idea if it’s been ten seconds since I drank that potion or thirty — and having to dig to the basement of my magic menu to find out is such a pain that I’d rather not use temporary effects at all. Yeah, the potion resistances are really a big problem. I don’t even use them because they’re so transparent and there’s no feedback about their effect. In all fairness, you could mod WoW to look like that. But like you noticed, there’s plenty of information that is not available in an ambient form: You can’t eyeball a wolf to determine it’s rough level. You can’t look at your sword and see the poison on it. Those HUDs and numbers are a necessary evil for now. I gotta agree with Michael Hartman. Games are about interactivity, and THAT has to be the focus. Immersion, graphics, story… they’re all nice things to have, but they absolutely must not get in the way of a good interface (whether it’s player-to-game or game-to-player). Lots of games get away with not showing damage indicators and other such statistics onscreen, despite the fact that all games are intrinsically about numbers… I’ve never seen someone complaining that New Super Mario Bros. is unclear about how much damage a fireball does to Bowser, for instance. If Super Mario RPG tried hiding the fireball’s damage indicator, though, I’m sure it’d be a different story. I suppose the lack of numbers is only a nuisance in RPGs because this genre is more overt about its number-y-ness, with levels and hit points and cooldown counters and whatnot. Beating an RPG requires extensive knowledge about its underlying math, whereas beating an action game can be done with nothing but quick reflexes. That’s an interesting point. I wonder if the genre or other aspects of the game shape people’s expectations and thus their willingness to suspend disbelief on that stuff. A frustrating ui could be a breaker for a game, but the sheer expansiveness of the world makes up for any and every failing, the fact that the devs KNOW you’ll get immersively lost in their world must have contributed to their minimalistic ui decisions-immersion is king. In both Morrowind and Skyrim, the world levels up with you — They just did a far better job of it. I find the lack of information a feature in many ways. The illusion spells are a failure of it, but I think the illusion spell system is a failure in itself: they probably should have said ‘weaker’ enemies, rather than ‘level 6’ — if one is going to be vague, be vague. Don’t give a fixed number without a comparison. I’d make fun of the interface, but after playing Oblivion I really can’t: the horrific Oblivion interface was far worse, in my mind, than Oblivion’s leveling-of-the-world. I do wish Skyrim had been designed for PC rather than for console, but given those parameters, it’s really not as bad as it could be. Not exactly a recommendation I hope to see on the boxes, mind. Wouldn’t the “best” game be that one “without” Ui where you CAN still see the Poison on your blade? Fear could change an NPCs posture etc… I think the problem does not stem from the minimalistic UI but from the missing graphical effects. Those are all good things, and Skyrim does them to some extent. But there comes a point where you have to make a trade off between usability and realism. All Elder scrolls since Morrowind the world has leveled with you. In Oblivion it just did it at a faster rate than your character so the game was easier if you beat it quick as possible. With that said I still didn’t have a problem with that and the game was very enjoyable overall, I plugged in 200 hours (not even half of what I put into Morrowind, but still got my $50 worth). Skyrim’s UI is better than Oblivion also and it has grown on me with in the first 5 of over the 50+ hours I’ve spent on the game so far and it becomes very simple. The only thing really bad about Skyrim’s UI is the 3D star map for skills-tree menu and the world map. The rest of it works very quickly. TIP: don’t use the mouse to navigate the menus so much and use WSAD and you’ll realize it’s way quicker. I think that’s what they intended. People blame it on consoles, but in all honestly it’s just quicker and more efficient than clicking through a bunch of tabs like most RPGs. The inventory and quick favorites works nicely and as always mapping items in your favorites list to the number keys. As a long time PC gamer I’ve always used hotkeys anyhow and remap it all to my trusty old Belkin Nostromo n50 speedpad to how I like so I don’t have to pick my hand up. Customization is the great thing about PC gaming afterall and if anyone really hates the UI there’s always others to choose from once the dev community picks up. Oblivion’s UI was basically everything mashed into one big box onscreen and in Morrowind the inventory was like that too. I don’t know how anyone who hated Morrowind and Oblivion could love Skyrim though, it’s still an Elder Scrolls game and is very similar in structure gameplay-wise. The graphics are way better which I guess helps some things, but it makes it sound like you never really played them saying that you hate them, but to each their own. Personally what sets it apart for me is the level design. They really went all out. Many of Oblivion’s dungeons were too similar, which was a step back from Morrowind. A lot of people didn’t like the Skyrim leveling system either, but in all honestly rather than plugging tons of stats in at each level up, the game levels you up by how you play which to me is much more role-playing than creating a super character who does everything to the maximum (which really also makes the races pointless for a lot of games since everyone is essentially the same when hitting upper levels). The one thing that’s a real let down in Skyrim (at least for me)sure isn’t the UI, it’s the dragon fights. After a few it’s almost bothersome when a dragon pops up. The battles aren’t fun or varied and gets about as annoying as the cliff racers in Morrowind. The dragon shouts aren’t all that cool or useful either. The crafting system is really great though which adds a lot more value to the game for me. Skyrim is more than my laptop can handle, but the lack of notification that you have a disease is such a headsmackingly stupid missed opportunity at *increased* immersion. So what often happens if you’re sick…? So make the player sound like they have tuberculosis whenever they do any sort of prolonged exertion above walking (outside of combat). Skyrim really is highly immersive but I do feel it missed out on some serious oppurtunities there. As “Z” said earlier, it would’ve been awesome if they made it so that a sick player would cough, wobble around, do SOMETHING, instead I’m walking over half of skyrim with rock joint and not even bothering to take a breather. I also feel like they missed a bit of immersion with running. I mean can you run at even a jogging speed for ten hours straight? Apparently my character can. At least I can’t sprint forever, but even running should cause some sort of stamina issues. Vampirism is another thing! I’m playing in Skyrim damn’t! I don’t want to play as a slightly weaker Oblivion vampire, I want to play as a Skyrim Ice Vampire! The way they adjust it in this game makes it so annoying. It seems radically premature to claim Skyrim is “more immersive” than World of Warcraft, unless your definition of immersion boils down to simply virtuality or realism. I mean, it’s clear that vastly more gamers have spent vastly more time in WoW than in Skyrim. – World believability- This can range from visuals, conversation/UI interactions, to the overall plot devices and story/lore that accompanies the game. While dragons and magic are obviously fantasy, you accept them in this reality as the normal aspects that compose this world. -Visuals – Bethesda has come a long way since the visuals of Oblivion. More so the correlation is seen between Fallout 3: New Vegas and the current Skyrim engine. While both engines are claimed to be different according to Lead Game Designer Todd Howard, you can see the small similarities. Visuals however, make or break your experience. Many have claimed that while playing Skyrim, sometimes you just have that moment where you see the cold air skim off the mountain peaks that house a beautifully designed Dwemer ruin and……just stare. The lighting,architecture and texture choices for the visuals come together to form a truly incredible display of eye-candy. -Interface – As Apple realized with their design interface for the iOS, you need to keep it simple. A very challenging task for a game that includes vast amounts of loot, skills, magic options, weapons, apparel, craft, etc. This interface was simplified from Oblivion by separating everything into easy to access categories, with the extra feature of creating a ‘favorites’ menu. This menu can house your most commonly used items while causing the game to pause. Some might say that this freedom to change weapons or gear on the fly is ‘unrealistic’ and takes away from the immersion. To that I say: do you remember that this is a video game? This brings me to my final point. – Sound: an overlooked, but extremely important aspect of games, whether background music to establish theme or mood, ambient world sounds, or UI sound elements. – Interactivity: the more immediate the general responsiveness (in the form of intended actions based on user input, game information, or chat), the more users feel connection — a one-second delay can interfere with immersion. In fact, you can play with the reality factor in the visuals if this factor is handled well. You hated Morrowind? Morrowind is only the best Elder Scrolls (And hell Bethesda game)? I hate what they di to the levelign system, they took away a lot of choice and customization. Why does carry limit get raised wen I improve stamina? That makes no sense at all. Some people say it’s better because it gets rid of unnecessary stuff, well if you think that stuff is unnecessary, don’t use it. Having the CHOICE to use or not use something is better so you can determine yourself how valuable it is. It may not be useful for you, but it may be useful for my character build. I miss each character having their own speed, now everyone walks that the same pace. You character is way too cookie cutter. I don’t know how anyone can sit there with a straight face and say this leveling system is anything but crap. These games are becoming way to dumbed down. Fallout: New Vegas is not Fallout 3 Lastly, Bethesda did not make New Vegas, Obsidian did. The lack of information adds to the immersion. I don’t have a read out in real life what that guy is leaning on the wall down the block from me. At least until google glasses come out.) I have to observe him and come close.. sometimes talk to him. Skyrim accomplishes this with it’s lack of information. I find that realistic and part of game play. ( I often turn off the screen UI in Warcraft entirely and just fly around on my druid to see if I can navigate the world with no map as my own private mini game.) The UI in the vanilla game of Skyrim is not awful because of that. It is awful because it often does not work. Sometimes I have to go through a speech that was boring the first time because what I clicked on did not take. Things are not categorized well and it takes forever to deal with inventory.